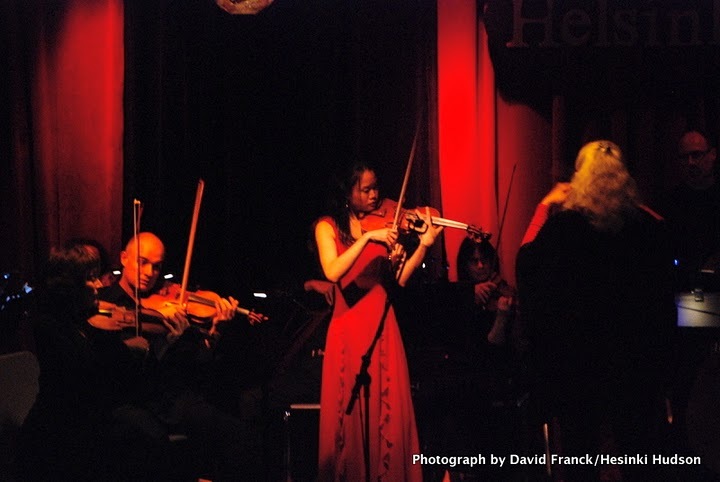 SOLO VIOLINIST KATIE HYUN first performed as soloist with symphony at age twelve and has since performed with the Houston Symphony, Dallas Chamber Orchestra, Philadelphia Orchestra, Concerto Soloists Orchestra in Philadelphia, among others. A graduate of Curtis Institute and State University of NY/Stony Brook, Katie received her Artist Diploma from the Yale School of Music in 2009, studying with Ani Kavafian. A winner of numerous awards and competitions around the country, Katie has appeared on television, NPR, collaborated with renowned bassist Edgar Meyer, and is a founding member of the new Amphion String Quartet playing “with gripping intensity… suspense… receiving a well- deserved ovation”, winning two prestigious competitions this year. COMPOSER and VIOLIST LJOVA (LEV ZHURBIN) is hailed by Billboard Magazine as “one of New York’s fastest-rising composers and instrumentalists,” and by the New York Times as “an eclectic with an ear for texture… strikingly original and soulful.” Born in 1978 in Moscow, Ljova moved to NYC in 1990 with his parents, composer Alexander Zhurbin and writer Irena Ginzbur. He divides his time between performing as a violist in diverse groups ranging from his own, LJOVA and the KONTRABAND, to string quartets, jazz combos and Gypsy bands; arranging music for Yo-Yo Ma, the Kronos Quartet, Jay-Z and others; and composing original music for film, TV, dance, and concert stage. CFO is pleased to perform “Plume” from his award-winning World on Four Strings album, a transcending piece blending classical with jazz and gypsy sounds. CONCERTMASTER SHEILA REINHOLD enjoys a varied career of solo and ensemble playing. Her first performance as soloist with orchestra was at age nine at NYC’s 92nd St Y, and at age fifteen she began her studies with Jascha Heifetz. She performed chamber music in concerts with Heifetz and Piatigorsky, has premiered works for violin and viola, served as Resident Musician at Harvard, and is the music director of Intimate Voices Chamber Concerts in New York. LUCY BARDO, cellist, is a long-time member of Calliope Renaissance Band, Berkshire Bach Society, and Columbia Festival Orchestra. 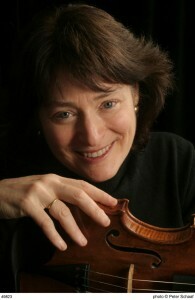 Having performed with many organizations such as the Metropolitan Opera, the New York Philharmonic, and Philharmonia Virtuosi, she has appeared as viola da gamba soloist for the Bach Passions with numerous choral groups including the Washington DC Choral Arts Society and the Berkshire Choral Festival. Lucy has multiple recording credits and currently teaches privately and at Simons Rock College. SEAN CARNEY, violinist, grew up in a musical family where both parents and all three siblings attended The Juilliard School. After also graduating from Juilliard, Sean enjoys an expansive career playing with numerous orchestras and ensembles in NYC for more than 20 years. In addition to performing with the Baltimore and New Jersey Symphonies, Sean has played with many award-winning Broadway shows including Les Miserables, Taboo, Shrek, South Pacific, Bombay Dreams, and The Addams Family. RONALD GOREVIC, violist, has toured internationally as a violist & been featured on numerous radio broadcasts. Also an accomplished violinist, he has recorded Schumann sonatas, & given British premieres of works by Rorem & Erb. He is a founding member of the Prometheus Piano Quartet, with which he has recorded works of Saint-Saens and D’Indy. Currently teaching at Smith College, his latest recording of Brahms’ clarinet quintet & trio (arranged for viola) has just been released by Centaur Records. BEN HARMS, percussionist, enjoys a diverse career performing with mainstream orchestras such as the Metropolitan Opera (since 1968), and also the music of prominent modern composers like Steve Reich, Lou Harrison, John Cage, and Olivier Messiaen. Also a specialist in early music, Ben plays with numerous period-instrument ensembles, including the Naumburg award-winning Calliope Renaissance Band and the Boston Early Music Festival. He is proud to be affiliated with Columbia Festival Orchestra for the past 15 years. ISADORA KOHON-TERAN, violinist, has been a freelance violinist in New York for many years. She was a member of the Kohon String Quartet, an original member of the Long Island Philharmonic, and a member of The Bronx Arts Ensemble for many years. She has performed on Broadway in Gypsy, The Wiz, and Peter Pan. STAN KURTIS, violinist, a Juilliard graduate, has extensive solo, orchestral, film, TV and Broadway credits including: NY Pops (since 1983), Met Opera/City Center Orchestras, ABT, and CFO among others. In addition to playing with stars like Sinatra, Luther Vandross and Sammy Davis, he was the soloist on camera for Al Pacino’s Tango in Scent of a Woman. Stan has been a soloist with the NY Pops at Carnegie Hall, Jazz in July at 92nd St. Y, and Washington Chamber Symphony at Kennedy Center. Recording highlights include “TheTango Project” (Nonesuch, Billboard #1). CARYL PAISNER, cellist, is an active chamber, orchestral and studio musician in NYC. She founded the cello quartet CELLO, appearing in chamber halls throughout the US and in Europe. Caryl has played in many New York groups including the New York City Opera Orchestra, the American Composers Orchestra, the Ron Carter Nonet, and the Radio City Christmas Show Orchestra. She toured Europe with Barbra Streisand in 2007 and has played on Broadway for many years, recently completing 2 ½ years with Lincoln Center’s South Pacific. CLAUDIA SASLOW, violinist, spent the first ten years of her orchestral career in Europe as a full-time member of the Netherlands Chamber Orchestra, subsequently performing regularly with Rotterdam Philharmonic and Netherlands Radio Philharmonic for several years. She has played numerous shows on Broadway, film soundtracks, TV broadcasts, and with American Symphony Orchestra, Brooklyn Philharmonic, and Spoleto Festival of Two Worlds (Italy and Charleston, SC). Claudia is a member of Lake George Opera Orchestra and Queens Symphony. DOROTHY STRAHL, violinist, plays with American Symphony Orchestra, American Ballet Theater Orchestra, American Composers Orchestra and the Mostly Mozart Festival Orchestra. A graduate of The Juilliard School, she studied at Tanglewood, Yale University at Norfolk and in Europe with Franco Gulli and Nathan Milstein. She served as a member of the NY Philharmonic and on tour with the St. Paul Chamber Orchestra under direction of Pincus Zuckerman. 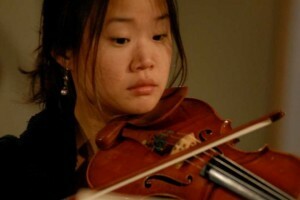 She has been a guest participant with the Chamber Soloists of Austin, TX. LIUH-WEN TING, violist, is co-founder of Ensemble Meme, a former member of the Meridian Quartet, and has recently performed with the Argento ensemble, Cassatt String Quartet, Manhattan String Quartet, and ensemble Pi. As a proponent of contemporary music, Liuh-Wen has taught at the Composers Conference at Wellesley College since 1993, and has performed at numerous international music festivals. She performs regularly as a member of the Orchestra of St. Luke’s, the Westchester Philharmonic, and the Berkshire Bach Society. ALEXANDER VSELENSKY, violinist, was born in Ukraine, and received degrees from Gliere College of Music in Kiev and the Manhattan School of Music. A long-time member of the American Symphony Orchestra, Lake George Opera, and Queens Symphony Orchestra, he served for several years as Concertmaster of Tri-Cities Opera in Binghamton, NY. He has played with more than twenty Broadway musicals, as well as movie soundtracks, recordings such as Sinatra, Bennett, Cole, and TV shows such as Letterman, View, Today. PETER WEITZNER, double bass, is a Juilliard graduate and has performed with Solisti New York, Jupiter Symphony, EOS Ensemble, and Philharmonia Virtuosi, among others. As soloist, he appeared with the Baltimore Symphony and premiered Sheila Silver’s Chant for bass and piano. An avid chamber musician, Mr. Weitzner is curator and host of the Brooklyn Public Library Chamber Players. He has performed with numerous chamber ensembles including the Chamber Music Society of Lincoln Center, Orion Quartet, Ensō Quartet, Trio Solisti, Berkshire Bach Society, and many others.